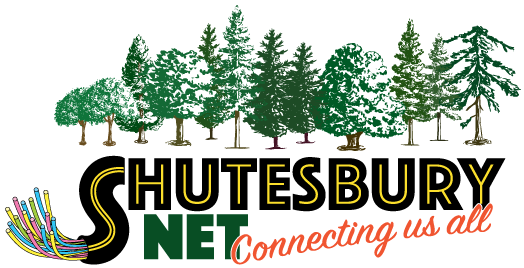 High-speed fiber internet is coming to Shutesbury! *These fees do not include state and federal mandated taxes and fees which will be about $3 for internet and $7 for phone service. *These fees rely on 75% of homes in Shutesbury taking service. If less people sign up, these monthly charges will be higher because we all share the expense of running our town-owned network. To bring the fiber optic cable from the curb into your home there are two parts of installation. If you want to have your house connected, you must sign up BEFORE MAY 1st to get these rates. This fee covers your full standard installation to bring the fiber optic cable from the street to your home using the most direct route and install all necessary electronics (including a WiFi router!). It includes all parts, labor and materials regardless of your driveway length and if you have aerial or underground service. It’s everything you need to get broadband in your home. Battery backup for phone add $60. Digital phone service does not work when the power goes out so a battery backup unit provides up to 8 hrs of continued phone service. You can alternately purchase backup solutions on your own. Standard Installation includes in the most direct path and/or lowest cost option available. If you want a customized installation, you will pay the difference between the “lowest cost” option and the option you choose.